Students of color comprise a majority in public Montessori school enrollments around the United States, and practitioners are often asked for evidence of the Montessori Method’s benefits for these students. This article examines the relevant literature related to the experiences of students of color in public Montessori schools. Research finds Montessori education offers both opportunities and limitations for students of color in attending diverse schools, developing executive functions, achieving academically, accessing early childhood education and culturally responsive education, minimizing racially disproportionate discipline, and limiting overidentification for special education. Public Montessori education’s efficacy with students of color may be limited by several factors: the lack of diversity of the teaching staff and culturally responsive teacher education, schools that struggle to maintain racially diverse enrollments, and the challenge of communicating Montessori’s benefits to families with alternative views of education. The review concludes with directions for future research. Mira Debs is a PhD candidate in sociology at Yale University. Katie E. Brown, PhD, is the DC Regional Coordinator for the National Center for Montessori in the Public Sector. Alston, L. (2008). Why we teach: Learning, laughter, love, and the power to transform lives. New York, NY: Scholastic. Anyon, J. (2014). Radical possibilities: Public policy, urban education, and a new social movement. New York, NY: Routledge. Au, W. (2009). Unequal by design: High-stakes testing and the standardization of inequality. New York, NY: Routledge. Benson, J., & Borman, G. (2010). Family, neighborhood, and school settings across seasons: When do socioeconomic context and racial composition matter for the reading achievement growth of young children? Teachers College Record,112, 1338–1390. Berends, M., & Penaloza, R. V. (2010). Increasing racial isolation and test score gaps in mathematics: A 30-year perspective. Teachers College Record, 112, 978–1007. Braddock, J. H., II, & Gonzalez, A. D. C. (2010). Social isolation and social cohesion: The effects of K-12 neighborhood and school segregation on intergroup orientations. Teachers College Record, 112, 1631–1653. Carter, S. C. (2000). No excuses: Lessons from 21 high-performing, high-poverty schools. Washington, DC: Heritage Foundation. Cossentino, J. (2010). Following all the children: Early intervention and Montessori. Montessori Life, 22(4), 38–45. Diamond, A., & Lee, K. (2011). Interventions shown to aid executive function development in children 4–12 years old. Science, 333, 959–964. Duax, T. (1989). Preliminary report on the educational effectiveness of a Montessori school in the public sector. The NAMTA Journal, 14(2), 55–62. Ervin, B., Wash, P. D., & Mecca, M. E. (2010). 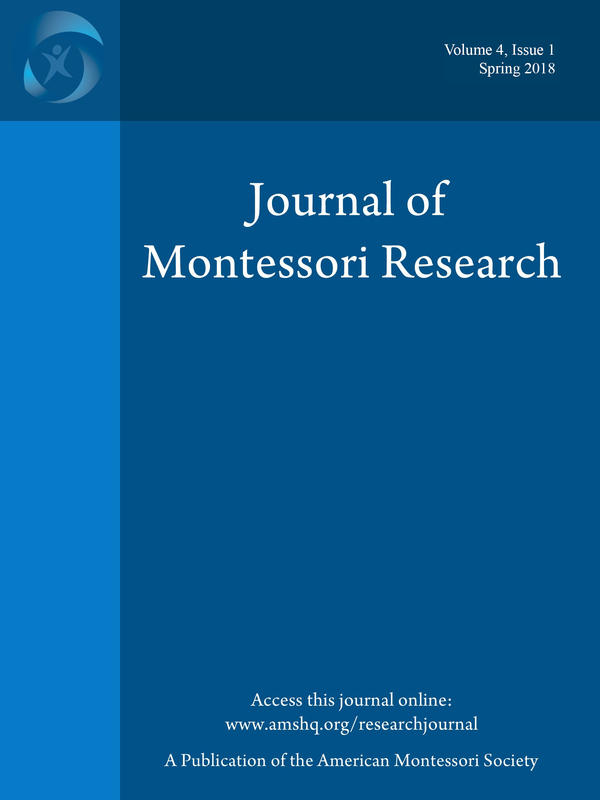 A 3-year study of self-regulation in Montessori and non-Montessori classrooms. Montessori Life, 22(2), 22–31. Fort Peck combines language immersion with Montessori methods. (1998). Tribal College Journal, 9(4), 15. García, S. B., & Ortiz, A. A. (2006). Preventing disproportionate representation: Culturally and linguistically responsive prereferral interventions. Teaching Exceptional Children, 38(4), 64–68. Goldsmith, P. R. (2010). Learning apart, living apart: How the racial and ethnic segregation of schools and colleges perpetuates residential segregation. Teachers College Record, 112, 1602–1630. Green, T. D. (2005). Promising prevention and early intervention strategies to reduce overrepresentation of African American students in special education. Preventing School Failure, 49(3), 33–41. Hall, H. R. (2006). Mentoring young men of color: Meeting the needs of African American and Latino students. Lanham, MD: Rowman & Littlefield Education. Hixon, S. (2002). Blending Head Start and Montessori: The best of both worlds. Montessori Life, 14(4), 37–38. Irvine, J. J. (1991). Black students and school failure: Policies, practices, and prescriptions. New York, NY: Praeger. Kunjufu, J. (2005). Keeping Black boys out of special education. Chicago, IL: African American Images. Ladson-Billings, G. (1994). The dreamkeepers: Successful teachers of African American children. San Francisco, CA: Jossey Bass. Ladson-Billings, G. (1995). Toward a theory of culturally relevant pedagogy. American Educational Research Journal, 32, 465–491. Ladson-Billings, G. (2013). Lack of achievement or loss of opportunity? In P. L. Carter & K. G. Weiner (Eds. ), Closing the opportunity gap: What America must do to give every child an even chance (pp. 11–23). New York, NY: Oxford University Press. Ladson-Billings, G., & Tate, W. F., IV (1995). Toward a critical race theory of education. Teachers College Record, 97, 47–68. Lewis, A. E. (2001). There is no “race” in the schoolyard: Color-blind ideology in an (almost) all-white school. American Education Research Journal, 38, 781–811. Lewis, C. W., Chambers, T. V., & Butler, B. R. (2012). Urban education in the 21st century: An overview of selected issues that impact African American student outcomes. In J. L. Moore III & C. W. Lewis (Eds. ), African American students in urban schools: Critical issues and solutions for achievement (pp. 11–30). New York, NY: Peter Lang. Lillard, A. S. (2005). Montessori: The science behind the genius. New York, NY: Oxford University Press. Lillard, A. S. (2012). Preschool children’s development in classic Montessori, supplemented Montessori, and conventional programs. Journal of School Psychology, 50, 379–401. Lillard, A. S. (2013). Playful learning and Montessori education. American Journal of Play, 5, 157–186. Makris, M., & Brown, E. (in press). A different type of charter school: In prestige charters, a rise in cachet equals a decline in access. Journal of Education Policy. Montessori, M. (1976). Education for human development: Understanding Montessori. New York, NY: Schocken. Moody, M. J., & Riga, G. (2011). Montessori: Education for life. In L. Howell, C. W. Lewis, & N. Carter (Eds. ), Yes we can! Improving urban schools through innovative education reform (pp. 127–143). Charlotte, NC: Information Age Publishing. Murray, A., & Peyton, V. (2008). Public Montessori schools: A delicate balance. Montessori Life, 20(4), 26–30. National Center for Montessori in the Public Sector. (2016b). 2016 Teach Montessori current trainee survey: Summary report. Washington, DC: Author. Newton, X. A. (2010). End-of-high-school mathematics attainment: How did students get there? Teachers College Record, 112, 1064–1095. Nyland, L. (2015). Amendment to the new student assignment plan regarding Leschi Elementary blended model for the 2015–16 school year. School Board Briefing/Proposed Action Report. Seattle, WA: Seattle Public Schools. Paris, D., & Alim, H. S. (2014). What are we seeking to sustain through culturally sustaining pedagogy? A loving critique forward. Harvard Educational Review, 84, 85–100. Paris, D., & Winn, M. T. (2014). Humanizing research: Decolonizing qualitative inquiry with youth and communities. Thousand Oaks, CA: SAGE. Pollock, M. (2008). Everyday antiracism: Getting real about race in school. New York, NY: The New Press. Roberts, J. C., & Fleming, D. J. (2016, January). Mapping the landscape of public Montessori in South Carolina. Paper presented at the annual meeting of the Southern Political Science Association, San Juan, Puerto Rico. Rodriguez, L., Irby, B. J., Brown, G., Lara-Alecio, R., & Galloway, M. M. (2005). An analysis of second grade reading achievement related to pre-kindergarten Montessori and transitional bilingual education. National Association of Bilingual Education. In V. Gonza?lez & J. Tinajero (Eds. ), NABE Review of Research and Practice (Vol. 3, pp. 45–65). Mahwah, NJ: Lawrence Erlbaum Associates. Stevenson, B. (2016, March 12). American injustice: Mercy, humanity, and making a difference. Dr. Nancy McCormick Rambusch Lecture at the annual meeting of the American Montessori Society, Chicago, IL. Thernstrom, A., & Thernstrom, S. (2004). No excuses: Closing the racial gap in learning. New York, NY: Simon & Schuster. Wells, A. S., Holme, J. J., Revilla, A. T., & Atanda, A. K. (2009). Both sides now: The story of school desegregation’s graduates. Berkeley: University of California Press. Wohlstetter, P. (2016, April). Intentionally diverse charters: Inside schools. Paper presented at the annual meeting of the American Educational Research Association, Washington, DC.